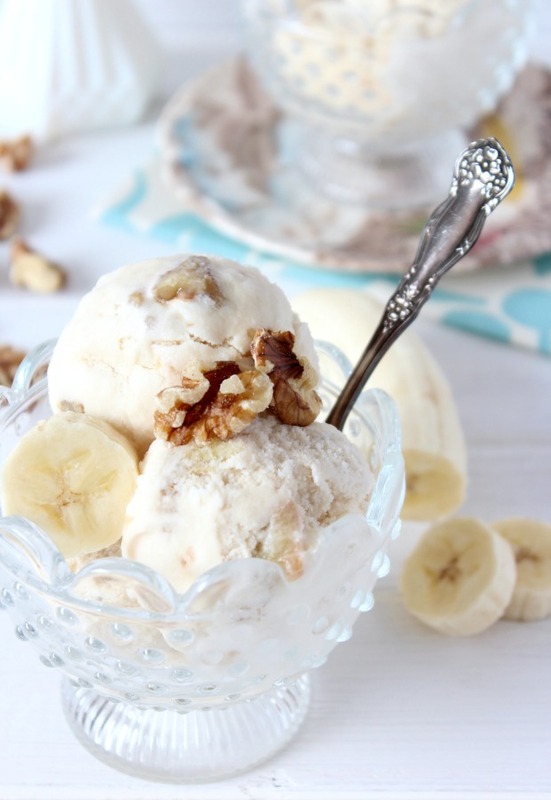 Bananas foster ice cream recipe with delicious swirls of rum-infused caramel, chunks of buttery banana and crunchy walnuts. So tasty! We had two bananas sitting on the kitchen counter the other day that weren’t going to make it through the night. You know the point where they’re not quite over-ripe, but biting into one could run the risk of getting some mushy brown stuff in your mouth? Nope, I’m not willing to chance it. The way I see it, I had two sensible choices. I could pop them into the freezer (for smoothies or muffins or something else down the road). Or, better yet, I could whip up some sort of dessert. That’s when the idea for bananas foster ice cream came to mind. If you’re fond of traditional bananas foster, this recipe is the frozen, ready-to-go version. Think swirls of rum-infused caramel, chunks of buttery banana and crunchy walnuts within a creamy homemade vanilla ice cream. Is there a better way to elevate bananas? Probably not. Plus, it was a good excuse to use our ice cream maker! Try this delicious ice cream recipe. You’ll be so very glad you did! 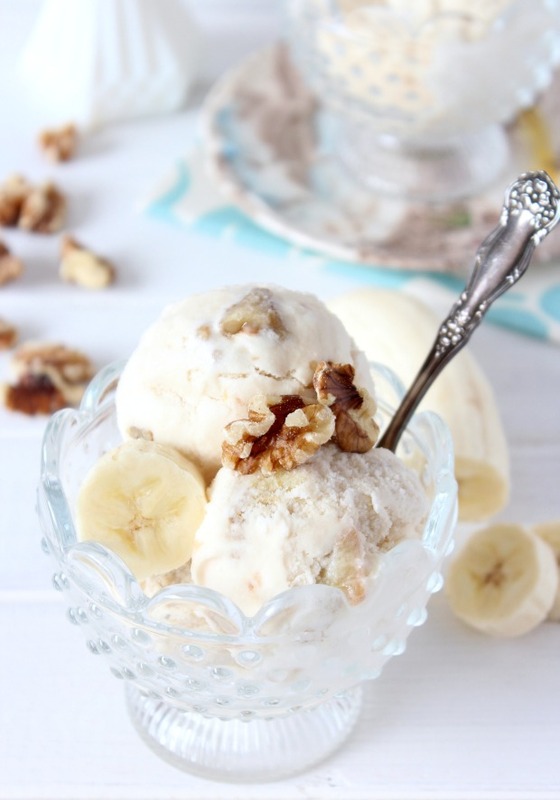 A delicious homemade ice cream recipe with swirls of rum-infused caramel, chunks of buttery banana and crunchy walnuts. In a medium bowl, whisk to combine the cream, almond milk, salt and granulated sugar until it's fully dissolved. Stir in the vanilla. Cover and refrigerate for 2-3 hours or overnight. In a medium skillet or saucepan, toast walnuts over medium-low heat. Transfer to a small bowl. Using the same skillet, melt the butter. Add the brown sugar and stir until it's dissolved and begins to bubble. Add the bananas and cook about 2 minutes, until softened. Carefully stir in the rum and cinnamon, and cook for another 2 minutes. Remove from heat and allow to cool. Transfer to a bowl, cover and refrigerate until you're ready to make the ice cream. After the cooling period, pour the milk and sugar mixture into an ice cream maker (I have this one and it's great!). Churn until thickened, about 15-20 minutes. When the ice cream is almost fully churned, gradually spoon in the banana mixture, followed by the walnuts. Let go for a minute or so (do not over mix). The ice cream will have a soft and creamy texture. If you prefer hard ice cream, transfer it to an airtight container and place in the freezer for about 2 hours. Remove about 10 minutes before serving. To cut back on the amount of dairy in this recipe, I used almond milk. You can substitute with the type of milk you prefer. Whole milk will certainly make it creamier. As well, you can decrease the rum if you want it more subtle or try different varieties, like spiced. This recipe is the perfect way to use up bananas, right? Of course, there are also these tasty banana recipes. My husband was glad I chose the dessert option. Let’s just say ice cream is one of his weaknesses. Maybe rum as well?! 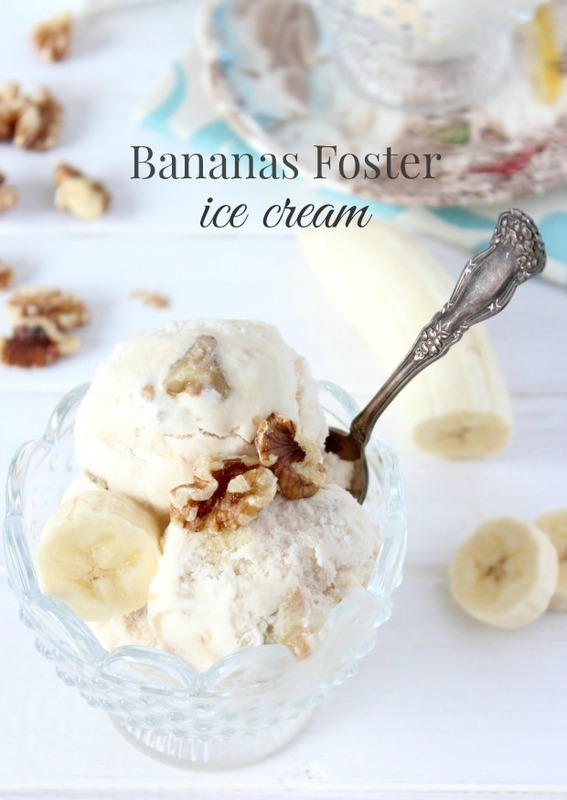 Be sure to pin this Bananas Foster Ice Cream recipe for later! Love caramel? 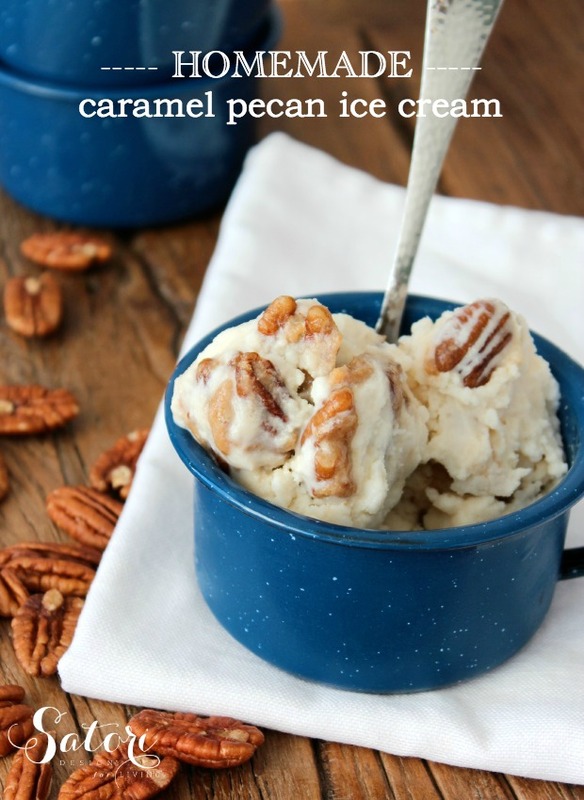 Check out this recipe for caramel pecan ice cream. One of our favourites! WOAH. This looks incredibly delicious and like the perfect dessert for a fancy spring or summer party! Thanks for sharing and for the gorgeous photos! Thanks Christina. Photographing ice cream is a little challenging, but the reward is getting to eat it after! Wow Shauna, that recipe literally has my mouth watering! It looks delicious and sounds amazing so does the caramel pecan, I have not had breakfast yet… I’m really glad this is not in my house right now, cause that is what I’d be wolfing down! Pinned! You sound like my husband- he’s a total ice-cream-any-time-of-the-day person! Yes, probably best reserved for the occasional weekend dessert since it’s pretty decadent! My son’s name is Foster, so this would be a perfect treat for him! You had me at rum :) This looks so delicious. I am always so envious of people who can whip up an amazing recipe with everyday ingredients. Definitely a keeper! Awesome, awesome idea. I love ice cream (who doesn’t? ), but it’s always nice to see something different that makes you think “Oooh, I want to try THAT!” The flavour combination sounds perfect. Plus it’s a good reason to ignore those blackening bananas for one more day. I usually pop my over ripe bananas in the freezer like you mentioned, and then use them for banana bread muffins etc.. This sounds like a great alternative though for something non-baked! I cant wait to try this as soon as my current batch of bananas goes brown! Given the choice between ice cream and something else, the answer is always ice cream. :) Love the fact that you’ve used bananas foster as your inspiration. It’s one of my favourite desserts… after ice cream, that is! The scourge of the blackening bananas! How come they go bad so quickly, eh? I feel like you buy them green and the next day they’re pure yellow with spots. Anyway. We just got an Ice Cream Maker and I can’t wait to try this recipe! Thanks for linking up to the Creative K Kids Tasty Tuesday linky, I can’t wait to see what you create next week!